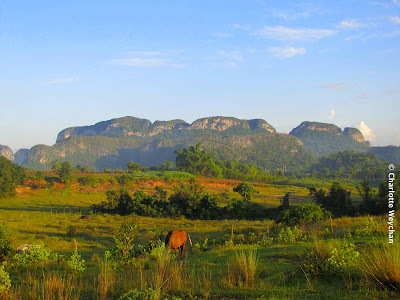 Our second week in Cuba took us to the west of the island - to Pinar del Rio province, and the town of Vinales, nestling in a gorgeous green valley that was designated a UNESCO World Heritage site in 1999. This is an agricultural area, rich in coffee, fruit and vegetables, and of course, tobacco, which is used to make fine cigars. This is a truly magical place, filled with trees, flowers and agricultural land as far as you can see. The town of Vinales (top) was colonized and developed by tobacco planters from the Canary Islands in the early 19th century. 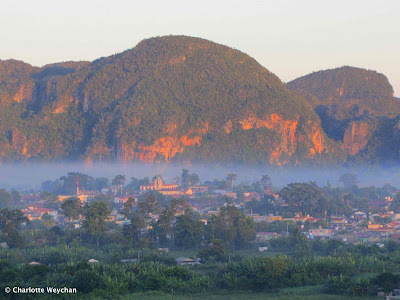 It was previously inhabited by runaway Taino slaves, and their story is told when you visit the caves just outside the town. But the landscape is very distinctive because of the strange shaped mogotes or hills (above) that surround it, which can be seen from everywhere in the valley. Vinales is also home to a magical miniature garden - right in the centre of the town, opposite the gas station, which I visited while staying there. Rather grandly named the Casa de Caridad Botanical Garden, it is indeed, filled to bursting with thousands of plants and trees, all clustered round the house of its founder, Caridad (pictured above, with me standing alongside looking hot!). 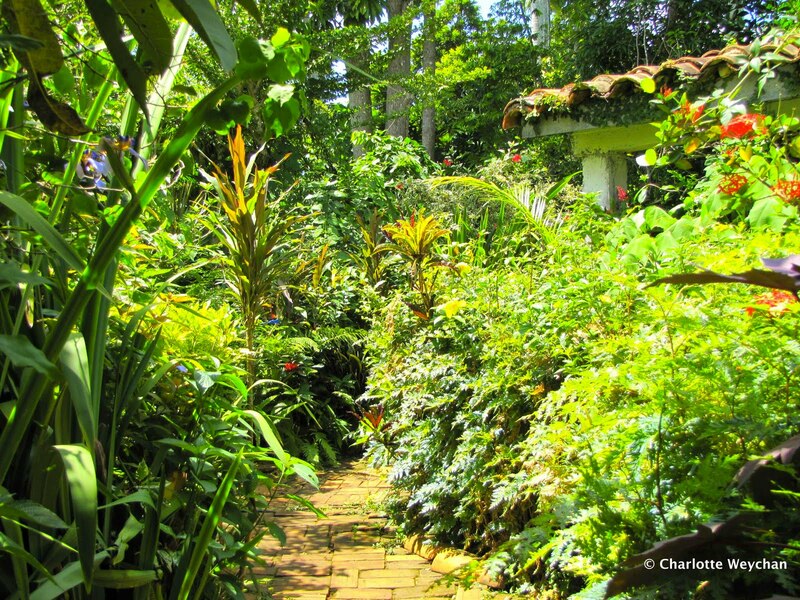 This little bit of paradise, filled to overflowing with an eclectic mix of fruit trees, medicinal plants, bromeliads, succulents and gorgeous tropical flowers, is a wonderful showcase for all the plants that grow in Cuba. And although it doesn't cover the same acreage as the Botanical Garden in Cienfuegos, you will find many fascinating species here, as well as palm trees and orchids. 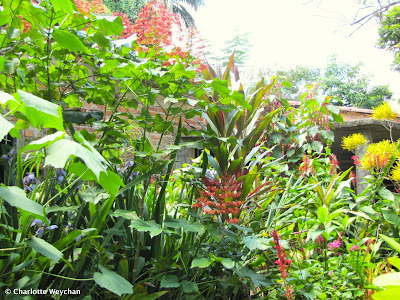 You walk through the garden gates are are met by the most astounding display of lush foliage and colour (above), and every inch of land adjacent to the house is filled to bursting with plants. It's a wonderful sight and as you look closer, you see just how many different plant species there are here. Further away from the house there are swathes of fruit trees - bananas, peaches, oranges and pineapples. 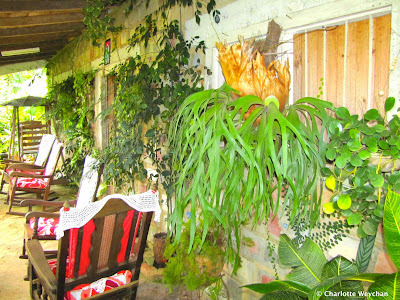 At the end of your tour, you get offered fresh fruit from the garden, which you can sit and eat on the terrace outside the house (above) in a typical Vinales rocking chair. There's no entry fee here and contributions are voluntary, but this is a delightful garden well worth visiting and making a contribution to the owners at the end of your tour. Today the garden is still run by the family, who continue to care for Caridad's garden. Definitely one to put on your list when you get to Cuba! Oh, I would love to go there! I wonder about the agricultural practices there? Agriculture and slavery the world over... it sickens me to think of those days and still workers barely paid for their labor. But this is such a beautiful post and the family who care for the paradise you share must have been so delighted to have you visit Charlotte. I LOVE your new header photo! Gorgeous!! It really does seem like a beautiful place. The new header photo is stunning! Its a beautiful place for sure and you are lookin every bit hot n beautiful next to the founder's portrait. Was a pleasure being here reading abt your Cuba visit and enjoying the photographs of the garden as well. Charlotte, it really does look like a Garden of Eden! So verdant! It really does look like it is overflowing with plants. Do they sell the plants too? That verandah looks like a most delightful place to sit and daydream awhile. Incredible pics....your opening pic is incredible. I had no idea that such beauty existed like this in Cuba....Viñales is now on my list for places to see:) Thank you so much for sharing.! Cracking shots of my homeland. I have many fond memories of Pinar del Rio and specifically of Vinnales (sorry, can't do Spanish letters on this keyboard!). Ta muchly. Randomly stumbled onto this site, and would like to mention that the "mogotes" are not "hills" in Spanish. Mogotes are made of limestone, and are found primarily (if not only) in Cuba. The limestone you probably already know about if you visited the caves that have so much water inside that you can travel by boat in them! :) Your photos are beautiful. 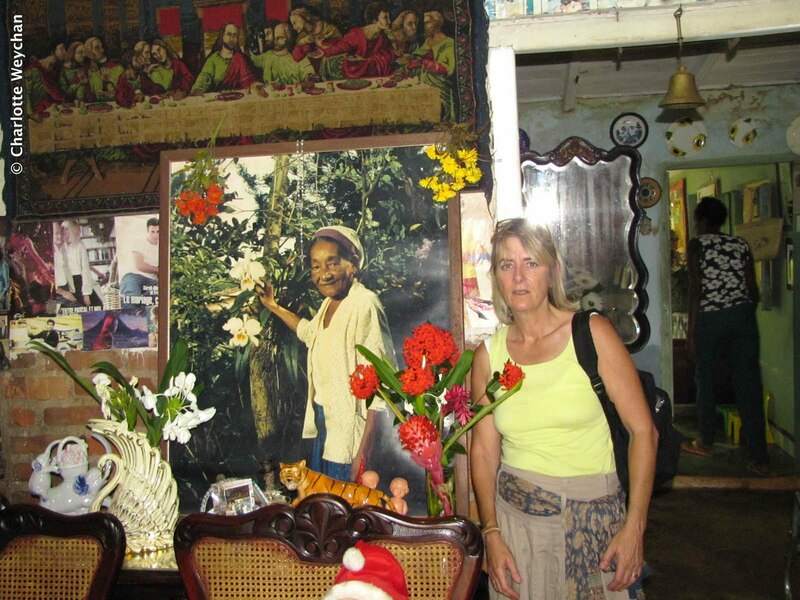 I miss the Pinar del Rio area immensely, and I will mention that I am an American who visited this past summer on a licensed trip to Cuba. 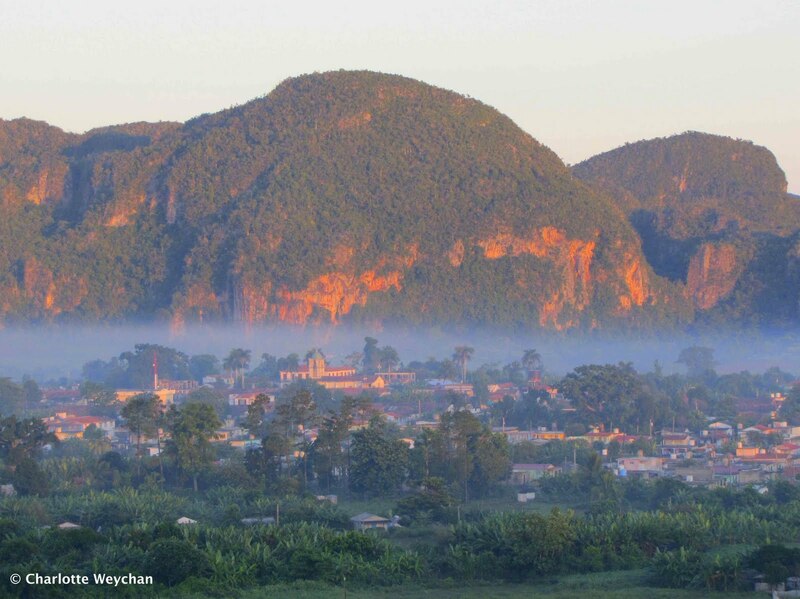 The Viñales region is simply stunning. I love your blog and so happy to see the pictures of my home land... if you ever find yourself in Cuba again, visit the Botanical Gardens in Havana - I went there many times as a child with my parents/school trips and found many wonderful supprises each time. Thanks for all you do exposing people to nature!